The interaction of a drug molecule with a receptor can be studied directly by measuring the ability of the drug to bind to the receptor. Kinetic analysis, involving the determination of the rates of association and dissociation, is used to determine dissociation constants [81-83]. For equilibrium analysis of the binding of a drug to a receptor, a compound with high radioactive specific activity and high affinity for the receptor is used as a ligand. Various concentrations of this radiolabeled drug are incubated with a membrane preparation suspended in buffer. Incubation is continued until binding equilibrium is attained. The membranes are then separated from the incubation medium, which contains free ligand, by either centrifugation or filtration, and the radioactivity in both fractions is determined by liquid scintillation counting. Some of the radiolabeled compound will bind to sites in the tissue other than the receptor that is being studied. This nonspecific binding is estimated by incubating the membrane preparation with the radioligand in the presence of a saturating concentration of an unlabelled drug that can specifically bind to the receptor being studied and will, therefore, compete with the ligand for binding. This unlabeled compound should inhibit the specific binding of the radioligand to the receptor, but will have low affinity for the nonspecific binding sites of the radioligand. The radioactivity that remains bound to the membrane preparation in the presence of this nonlabeled compound, which represents nonspecific binding, is subtracted from the total radioactivity, determined in the absence of the nonlabeled drug, to yield the specific binding of the radioligand to the receptor. The binding of a selective ligand to a homogeneous class of receptors should display certain characteristic properties. The ligand should bind to the receptor with high affinity, and the binding should be saturable. It is essential that the binding properties of the ligand correlate with the pharmacological properties of the drug if the binding site is a receptor. 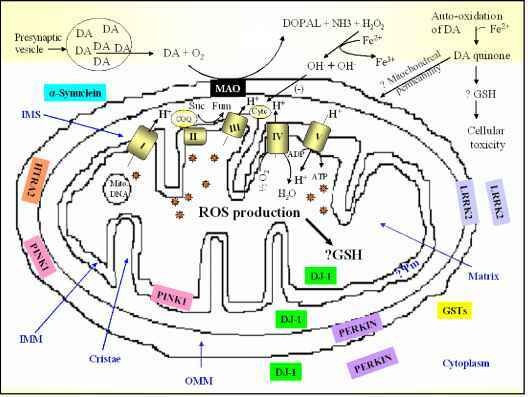 Thus, receptor agonists and antagonists should be able to inhibit the binding of the ligand with relative affinities that parallel their order of potency in pharmacological studies. This equation is in linear form. Plotting the bound/free radioligand on the Y axis against bound radioligand on the X axis is termed a Scatchard Plot and yields a straight line with slope equal to 1/ KD and an X intercept equal to Bmax. However, the Scatchard plot frequently is not linear, indicating that the interaction between ligand and receptor is complex. This may occur if the ligand binds to more than one class of binding sites or the interaction of the ligand with the receptor involves cooperativity. Studies on the ability of drugs to inhibit radioligand binding to receptors are used frequently to characterize the interactions of drugs with receptors. Drugs whose pharmacological effects are mediated by their interactions with specific receptors, should specifically bind to these receptors, inhibiting the binding of the radioligand. An evaluation of the order of potency of drugs in inhibiting radioligand binding can provide information on the mechanism of drug action and can be used to test whether a given radioligand is binding to a specific receptor class. In these types of experiments the binding of a specific radioligand is measured in the presence of various concentrations of unlabeled drug. If the unlabelled drug can bind to the receptor, then a curve can be produced with the following shape (Figure 11). Figure. 11. 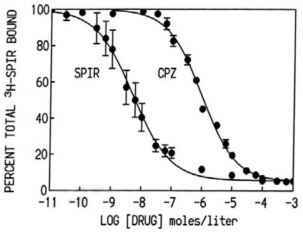 Effect of spiperone (SPIR) and chlorpromazine (CPZ) on the binding of [ H]-spiperone to a membrane preparation of rat striatum.